With an e-ink screen on the back the original YotaPhone was one of the weirdest smartphones around, yet somehow it’s made it on to a third iteration, dubbed the Yota3, which has just been announced in China. Many of its specs along with its design have been upgraded since the YotaPhone 2, but it’s the same core idea, with a 5.5-inch 1080p AMOLED screen on the front and a 5.2-inch 720p e-ink Carta II display on the back. That’s essentially an always-on secondary display that can display notifications a bit like the tiny extra screen on the LG V20 or HTC U Ultra, but being a lot bigger it can show a lot more, and even be used as an ereader. That aside the Yota3 sounds like a fairly standard mid-ranger, with a metal shell, a 12MP f/1.9 rear camera, a 13MP front-facing one, a Snapdragon 625 chipset, 4GB of RAM, a fingerprint scanner and a 3,300mAh battery, but no headphone port. Trouble is it has got a fairly hefty price, starting at 3,699 yuan (around $560/£415/AU$700) for a 64GB model and rising to 4,299 yuan (roughly $655/£485/AU$815) for a 128GB version or a 64GB “national gift set” version, which has a 316L stainless steel body instead of an aluminum one. And that price isn’t the only problem. 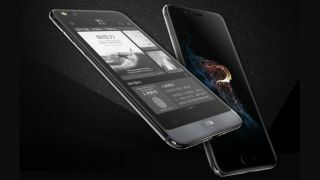 Right now the Yota3 is only available in China, and while a wider release is likely, it might not arrive in every key market, especially since the YotaPhone 2’s US release was cancelled. Still, we doubt many people will be losing much sleep over its absence, and if you really want an ereader on your phone you could always tape a Kindle to a Samsung Galaxy S8 for something approaching the high-end YotaPhone of our dreams.